Step back in time for an underground (literally!) feast of some of Poland’s finest cuisine deep in the heart of Krakow. A colleague who knows Poland well highly recommended Pod Aniolami (literally “Under the Angels,” translated) for both the excellent food and a walk back into medieval Poland. Not one to ignore such an enthusiastic endorsement, I obtained an early (1 pm) Easter reservation for lunch. The meal turned out to be a wonderful Easter feast that felt more like Christmas dinner. But then again, the entire holiday weekend felt more like Christmas than Easter. The flavors of Poland are perfect for winter, and the weather itself was oddly snowy for early spring. Pod Aniolami is a cavernous, below-ground restaurant near the main square in Krakow’s old town. Like most European cities, Krakow built atop itself over the years, such that this restaurant, now underground, is actually at what was ground level in the 14th century. Descending one of the restaurant’s two winding staircases to reach most of the restaurant’s seating areas, it feels like the cliched step back in time. Exposed masonry and stone peeks between plaster, with curving, arched doorways and what once served as windows, now bricked in place to form niches decorated with relics of the past, antique books, and the like. One seating area is at ground level, lit by skylights to give it an airy, more picnic-like setting for larger parties. While it seemed more fitting for Easter in that bright section, the upstairs seating misses the charm and historic feel of the walls below. The below-ground level has four chambers of seating, each with only four or five tables, so it feels quite intimate. Tall pewter candlesticks and thin, linen runners provide the only decoration on the rough-hewn wood tables. Seating is a mix of wooden chairs with cushions, or a hard wall bench. The benches have no cushions, but small woven, wool carpets are placed atop the benches – honestly, they were a bit uncomfortable for me, as I was wearing a dress, so I sat on my coat. Don’t get me wrong, I’m not complaining; the atmosphere was so unique that creature comforts were unnecessary, especially when enjoying course after course of hearty Polish food at its best. Polish food runs on the heavy side of the heavy side – pierogis, pork knuckle – well, pork everything – sausage (pork again), potatoes, cabbage, beets, and beer, for example – but at Pod Aniolami, it is so delicately prepared that it doesn’t feel heavy until you’ve finished your meal and reflected on all you’ve eaten. The menu is an extensive list of anything you could conjure, including vegetarian dishes. Selecting one dish was a daunting task. Luckily, the restaurant offers two set menus, which are not unreasonably priced and which surely could satisfy most diners. We chose the smaller option, which for 130 zloty (between 35-40 USD at the time) included two starters, a brothy beet soup, a main course choice between veal or fish, a dessert course, and a small cheese course. The portions are smaller than their a la carte counterparts on the menu – and thankfully so, as our waiter told us, “You won’t leave hungry.” I would recommend it, particularly for those with little previous experience with Polish food. 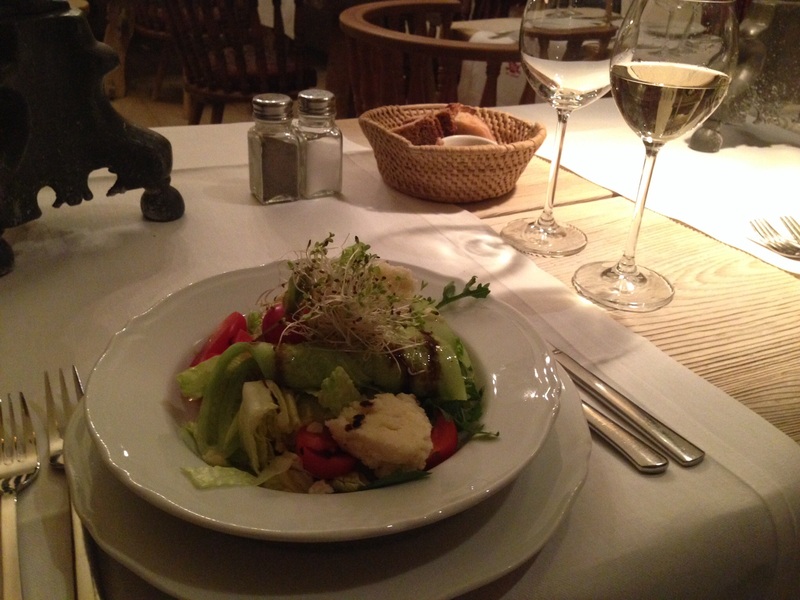 Our first, cold starter was a salad of mixed lettuces with tangy ewe’s cheese (sheep’s cheese), shaved cucumber, sprouts, and tomatoes. The starters were served alongside a basket of nutty, whole grain bred and sourdough loaf accompanied by the house special lard, in lieu of butter. The lard had bits of meat incorporated in for a chunky spread; Riga, Latvia’s Valtera restaurant had a far superior, smooth and smoky lard in my opinion. We each ordered a glass of a Polish white wine, which was sweeter than expected – somewhat like a semi-sweet Riesling but worked well with the salty cheese in the starter. Sidebar: The more I travel, the more I appreciate the quality and diversity of European wines, particularly in comparison to American wines; eastern European wines, while less exported and revered as their French, Italian, and Spanish brothers, are both interesting and reliably good. Out of order relative to the sequence listed on the menu, we next received a clear beet broth, simple and nourishing. We then received our pierogis – one each of the Russian (potato and cheese), mushroom, and shredded pork. Rather than being boiled or steamed, these had been pan-fried, giving them slightly crisp, buttery exterior. Cranberry chutney worked well as a condiment, particularly for the more bland pork dumpling. I ordered the veal chop with chanterelles as my main course. It was slightly tough and crisp on the outside, owing to having been pan-fried, but the flavor was good, and it was a good conduit for the luxuriously creamy sauce with chanterelles. Boiled potatoes laced with dill, and a salad garnish completed the presentation. Dessert proved to be the best course. What was billed as an apple cake actually turned out to be a tart apple pie with a vodka or whiskey sauce, vanilla ice cream, and whipped cream. It had the mildest sweetness, which drew attention to the tart, slightly spiced apple filling. It was fabulous, and I ate every bite of the large portion. The finishing course was sliced, smoked cheese (listed as ewe’s cheese on the menu, it tasted much more like cow’s Gouda) with a stewed plum, said to aid digestion. The sweet and savory combination was a nice finish to the meal. Our waiter was correct: We certainly did not leave Pod Aniolomi hungry. We were satisfied with the value of the meal and loved the atmosphere. 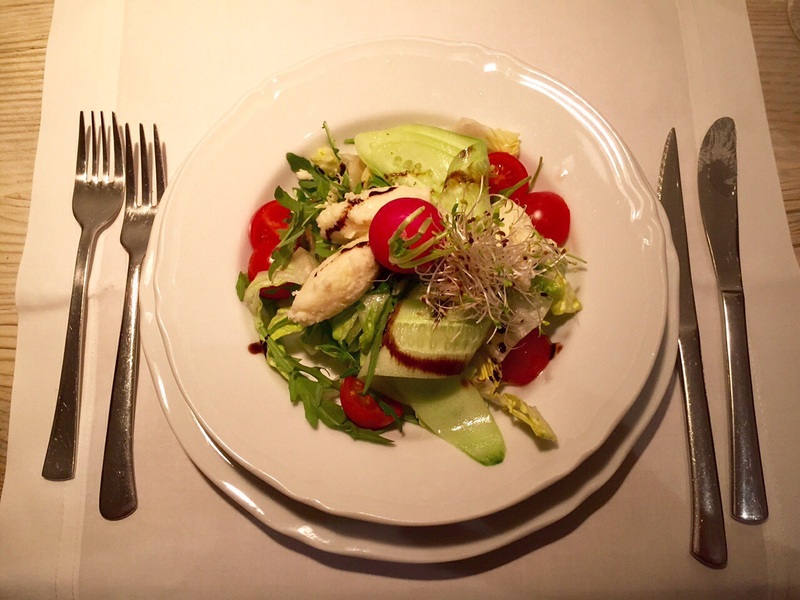 It was the best “takeaway” culinary journey I took on my long weekend trip to Poland.